Academic Works is the CUNY Libraries’ open repository for providing access to the research, scholarship and creative works of faculty, students and staff. Undergraduate Student Theses constitute one category of documents in Academic Works. There were 85 Baruch undergraduate student theses in Academic Works in Calendar Year 2018, including 10 additions during that period. The total number of downloads of the theses in 2018 was 8,343. The top 5 theses in terms of number downloads are listed in the table below. Commercial: General Motors, Korbank, SA, AVAST Software, TDI Power. Non-Profit: Institut National de la Recherche Agronomique (France), Stark Portage Area Computer Consortium (OH), RAND Corporation, Corporation for Education Network Initiatives in California (CENIC). Government: Bureau of Land Management, Environmental Protection Agency, National Government of Kenya, Department of Homeland Security. Military: U.S. Army Intelligence and Security Command, DoD Network Information Center, Navy Network Information Center. T he Library has 660 TI-89 graphing calculators available for Baruch College students to borrow for the spring 2019 semester. Students who are interested in borrowing a calculator must enter their Baruch email address on the calculator distribution entry form. Students will be selected from the list at random at 7:00 a.m. on January 31, 2019 and notified by e-mail to come to the circulation desk to pick up the calculator. Students who are selected from the waiting list will have until 10:00 p.m. on February 7 to pick up the calculator. Calculators that are not picked up by that time will be distributed at the 2nd floor circulation desk on a first-come, first-served basis beginning at 9:00 a.m. on February 8. Each student may only submit one entry to the waiting list. Multiple entries will result in disqualification from the calculator loan process. Entries must be submitted by 7:00 a.m. on January 31. The Newman Library has added a set of portable assistive technology devices to help ensure that all library users have access to the collections and services we offer. Each item was selected in consultation with the College’s Office of Services to Students with Disabilities. The devices are available only for use within the Newman Library by all current CUNY students, faculty, and staff. Items are loaned at the access services loan desk on the 2nd floor of the library and must be returned before that desk closes for the day. To avoid incurring an overdue fine borrowers should check with the library desk staff regarding the time that an item is due to be returned at the time that it is borrowed. 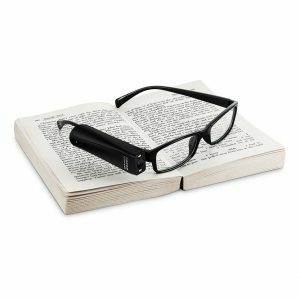 The following are the devices available for loan at the time of this post. 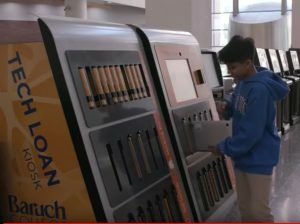 Other devices will be added based on recommendations from library users and the Office of Services to Students with Disabilities. 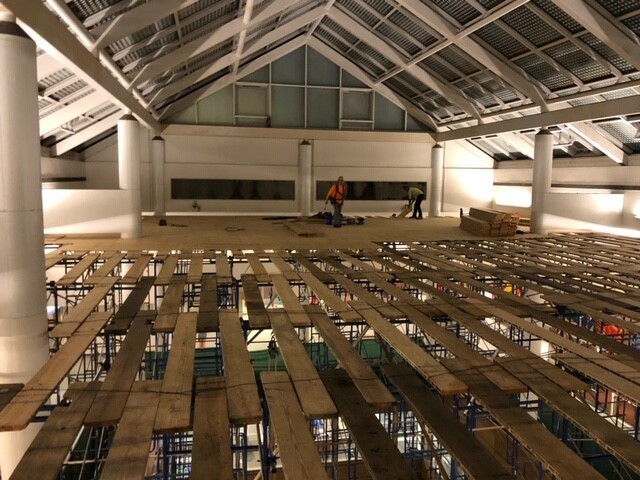 The scaffolding in the Library has been constructed to enable workers to replace the glass in the ceiling of the atrium, which has been the source of flooding in the building. It will take approximately three weeks for the scaffolding to be fully built and it will occupy the entire atrium space. The project will take at least six months. 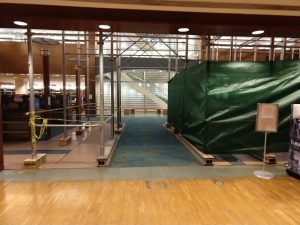 Library users should follow the signs to navigate safely around the work area and to locate services that have been temporarily moved. 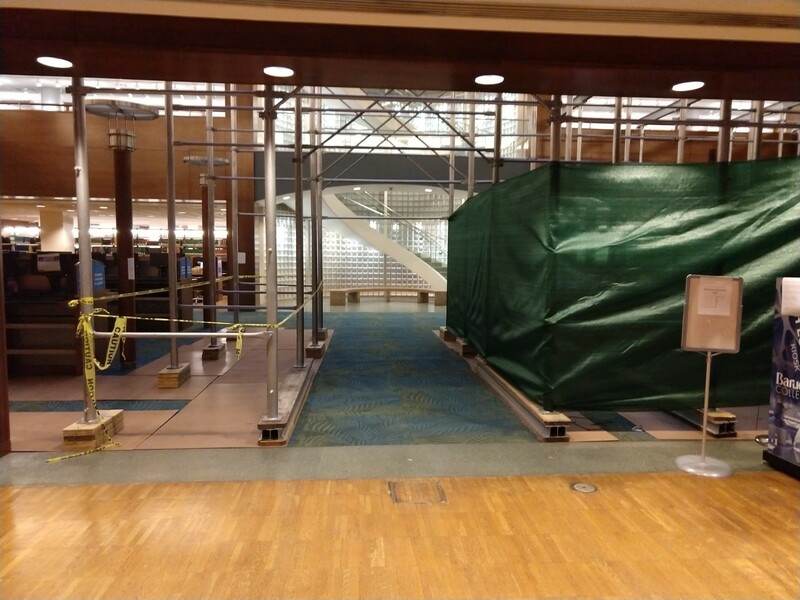 We regret the inconvenience to library users while this necessary repair work is done. 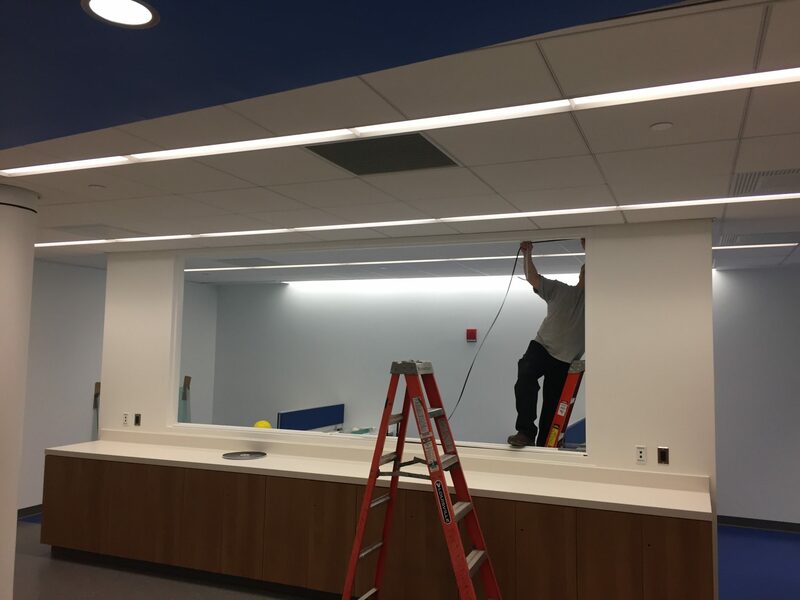 The project reflects the longstanding commitment of the College to maintain our building for the benefit of current and future members of the Baruch College community. 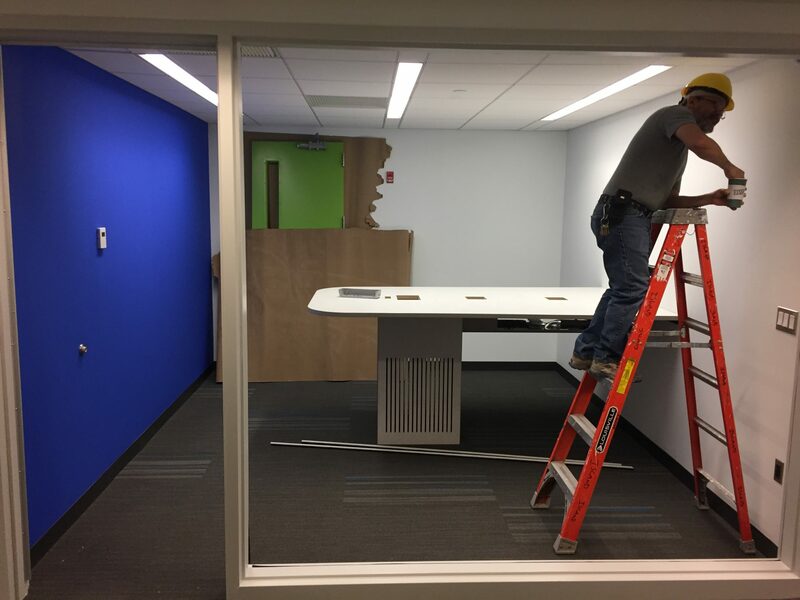 Thank you for your understanding and patience during this project. 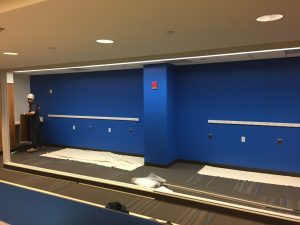 The reference desk has relocated to room 225 on the northeast side. Signs are posted to direct library users to the new location. 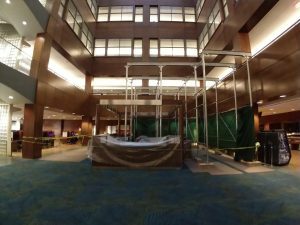 Today the standing workstations in the center of the atrium space will begin to be relocated to the perimeter of the space. 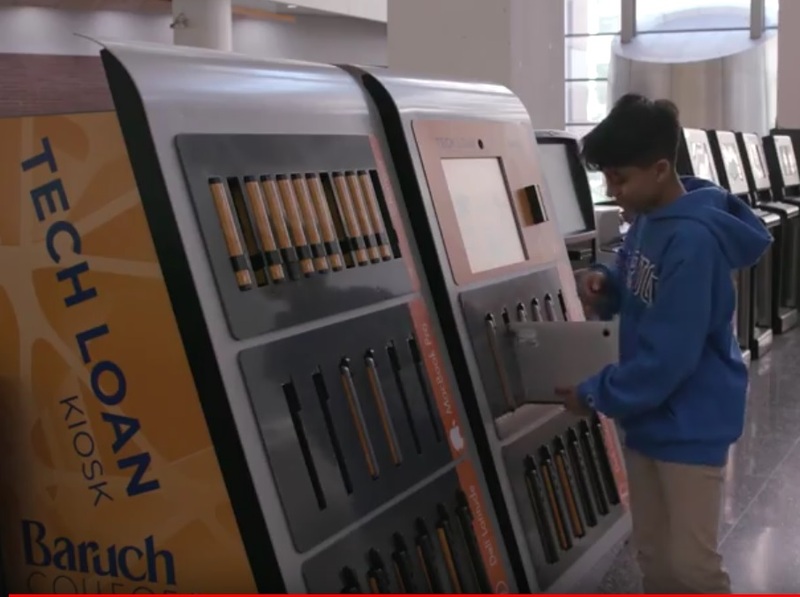 Students who use these computers to submit print jobs are reminded that the College provides a mobile printing service that enables students to submit jobs from their own mobile devices whether on or off campus. Students do not need to log into a computer on campus to print. Details on the mobile printing service are provided in a previous news post. The construction of the scaffolding has progressed past the library floors and has almost reached the atrium ceiling. Students may use their printing accounts to send documents from their mobile devices to any printer in the Library or the computer labs. There is no need to wait on line to log into a computer workstation on campus just to print. Students may send documents to the print queue from home, the local Starbucks®, or anywhere with a wifi connection. The print job can be released at any student print station on campus. The charge to the printing account occurs only when the print is actually produced. Remote printing requests that are sent to the queue, but are not printed are automatically deleted with no charge within a couple of hours. Students can use mobile printing by the cloud service via any web browser (https://printing.baruch.cuny.edu/) or by installing an app that is available for Apple and Android devices. Details are provided on the Wireless Printing web page. The Library has 677 TI-89 graphing calculators available for Baruch College students to borrow for the fall 2018 semester. Students who are interested in borrowing a calculator must enter their Baruch email address on the calculator distribution entry form. Students will be selected from the list at random at 7:00 a.m. on September 4, 2018 and notified by e-mail to come to the circulation desk to pick up the calculator. Students who are selected from the waiting list will have until 10:00 p.m. on September 10 to pick up the calculator. Calculators that are not picked up by that time will be distributed at the 2nd floor circulation desk on a first-come, first-served basis beginning at 9:00 a.m. on September 11. Each student may only submit one entry to the waiting list. Multiple entries will result in disqualification from the calculator loan process. Entries must be submitted by 7:00 a.m. on September 4. The Library conducted its first formal survey of users of the technology loan service desk from April 23 through May 18, 2017. We received 173 responses. The winner of the $20 Amazon gift card incentive was Brenda Kuang. We were pleased to see that overall satisfaction with the service is high with 96% of respondents reporting being satisfied or very satisfied. We were also pleased that two-thirds of users reported waiting times of 2 minutes or less, while 92% of borrowers were served in 5 minutes or less. Install additional software: Adobe Creative Cloud, statistical software, video editing, Chrome, etc. (Re)Enable Printing on the Baruch Network: This was available until we postponed an upgrade of our print management system. We will make wifi printing active on all the laptops again. Add equipment to loan: Phone and laptop chargers, headphones, mice, cameras, microphones, etc. Upgrade equipment: We are replacing many units with newer models over the summer. Increase the Number of MacBooks and units that loan for 3 days. Continue to reduce waiting time: We are looking into additional staff and streamlined procedures. 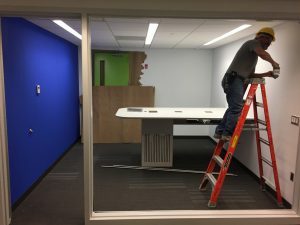 Expand Self-Service: We are purchasing a new loan kiosk for the Library and an additional, larger one for the 6th floor computer lab. 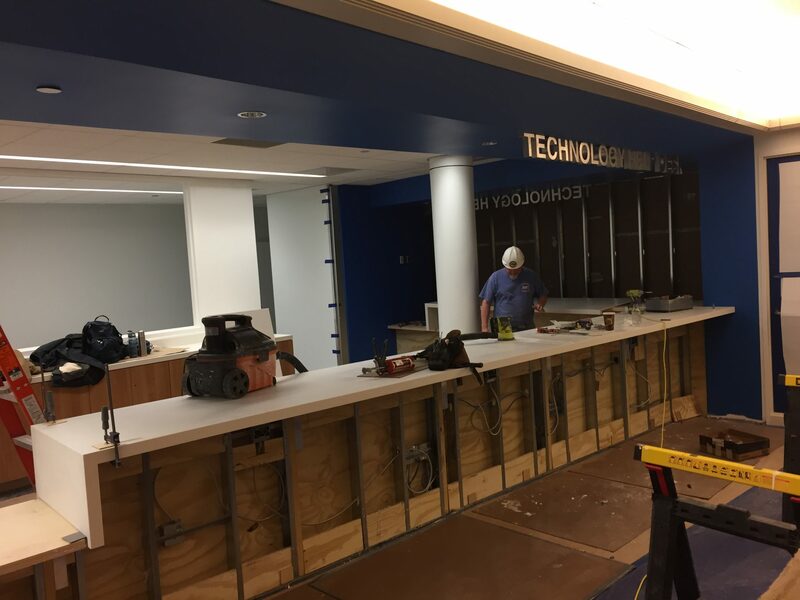 The technology loan service is among the most heavily used services of the Newman Library with over 50,000 loan transactions recorded between February and May 2017. The William and Anita Newman Library is pleased to announce the launch of Academic Works, a new online platform for showcasing the scholarly and creative work of Baruch students and faculty. This service provides students with the opportunity to make their works of scholarship freely available online for the world to view and download. Not only is each work given a stable, permanent location on the web, it is also indexed automatically by Google Scholar and CUNY’s OneSearch system, thereby increasing the likelihood of easy discovery by searchers around the world. Since the launch of CUNY Academic Works at several CUNY campuses in 2015, hundreds of faculty and students have uploaded more than 14,000 items into their local campus collections. Interest from scholars and students globally has been amazing: there have already been nearly 600,000 downloads of items from the CUNY collections. The launch of Academic Works at Baruch College is part of our effort to highlight the scholarship of our students. This new digital showcase, which already includes over 70 undergraduate honors theses, will soon include student posters from Creative Inquiry Day. For more information, please see the library’s guide to the service. On a related note, the Newman Library is planning an exhibition of published works by Baruch students in fall 2017. Students who are interested in having their work considered for inclusion should contact cio@baruch.cuny.edu. The William and Anita Newman Library is pleased to announce the official Baruch launch of CUNY Academic Works, a service that expands the reach of the scholarly and creative output of our faculty and students. 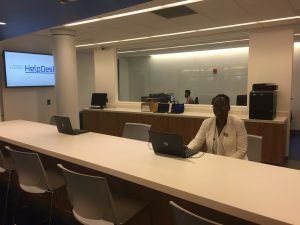 This service provides members of the Baruch community with an online platform where they can make their works of scholarship freely available online for the world to view and download. Not only is each work given a stable, permanent location on the web, it is also indexed automatically by Google Scholar and CUNY’s OneSearch system, thereby increasing the likelihood of the work being discovered easily by searchers around the world. In our soft launch phase at Baruch this spring, we already uploaded over 200 items (articles, book chapters, honors theses, etc. ), including more than 60 publications by Dean Aldemaro Romero Jr., and have seen those items downloaded seven thousand times by users from more than one hundred countries. Since the launch of Academic Works at several CUNY campuses in 2015 hundreds of faculty and doctoral students from across the university have uploaded more than 14,000 items into their local campus collections. Interest from scholars and students globally has been amazing: there have already been almost 600,000 downloads of items from the CUNY collections. In the fall, the library will offer a workshop for faculty about how they can use CUNY Academic Works to boost their scholarly profile and reach a wider audience. Details for this event will be announced in August. For more information about CUNY Academic Works, including instructions on how to upload items to the Baruch collections, please see the library’s guide to the service. The Martin E. (’59) and Laurie Kaplan Computing & Technology Center is open on schedule. 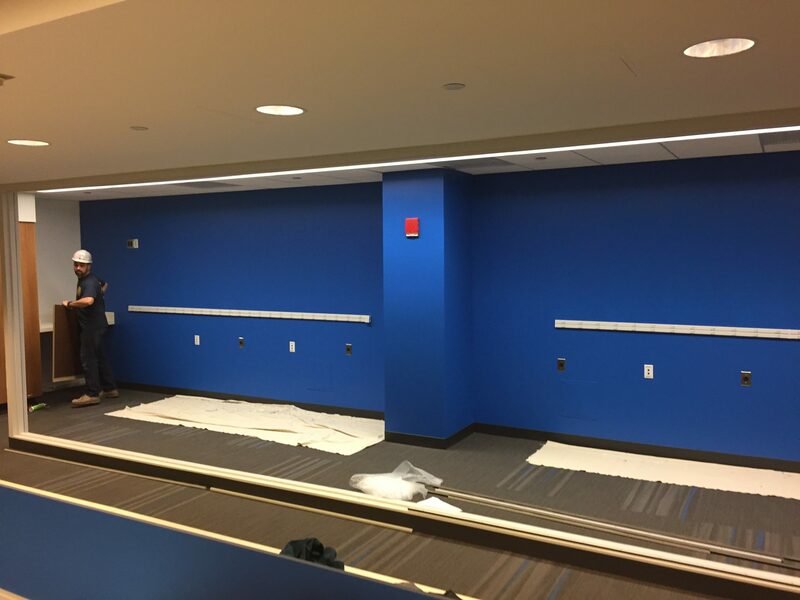 The College is on schedule with a complete renovation of the 6th floor student computer lab that will provide all new equipment and furniture, group collaboration rooms, and an expanded help desk. The new lab will open for the fall 2017 semester. 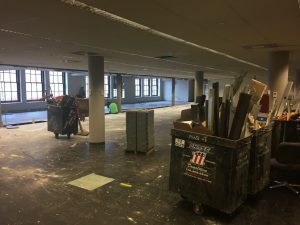 The construction work has now progressed to the north side of the floor where the entire wall will be removed to extend student seating to the windows. As a result, the lab will be closed from April 7 through August 25. 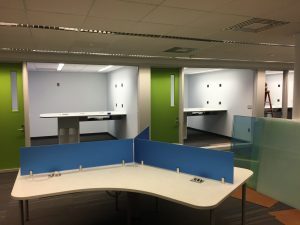 To accommodate lab users during this construction period, additional computers were placed throughout the Library, including rooms 344, 444 and 544. 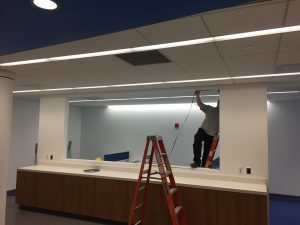 Printers were added to the Library’s third floor lounge area and in rooms 360, 460 and 560. Computer labs will also be available on the east side of the Vertical Campus on the 6th floor from 8:00 a.m. until 11:30 p.m.
Below are photos of the work in progress on the SOUTH side of the lab. 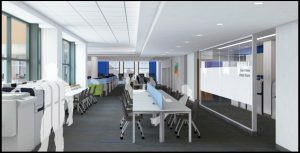 We look forward to announcing to the Baruch community the Grand Reopening of the Martin and Laurie Kaplan Computing and Technology Center. Baruch College is undertaking a complete renovation and upgrade of the main student computer lab on the sixth floor of the Information and Technology Building at 151 East 25th Street. Work will begin on Wednesday, November 16, and is expected to last through Summer 2017. 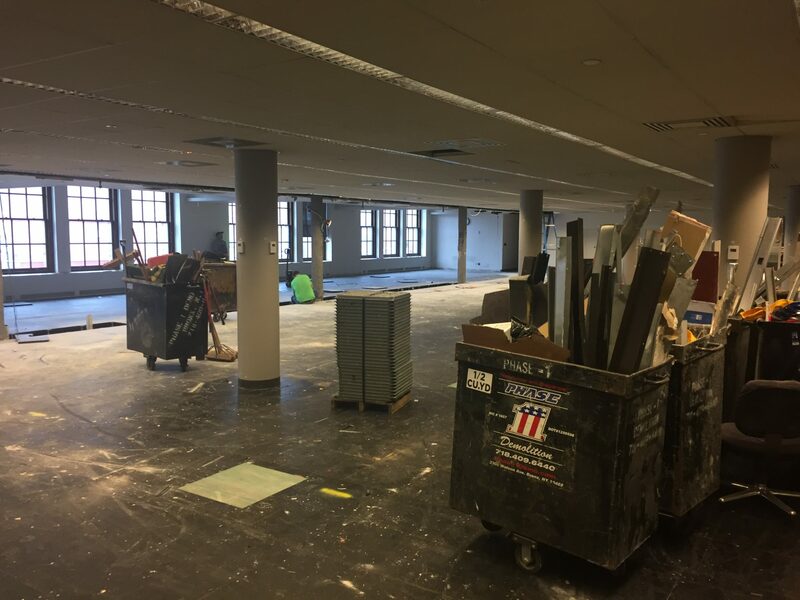 Our goal is to have the entire facility renovated by the start of classes in Fall 2017. 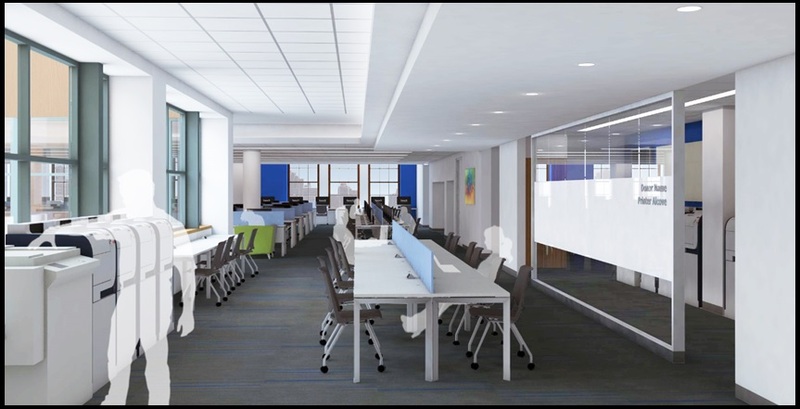 Although we regret the inconvenience students will experience during the renovation period, the College looks forward to providing an outstanding, new student-centered facility. 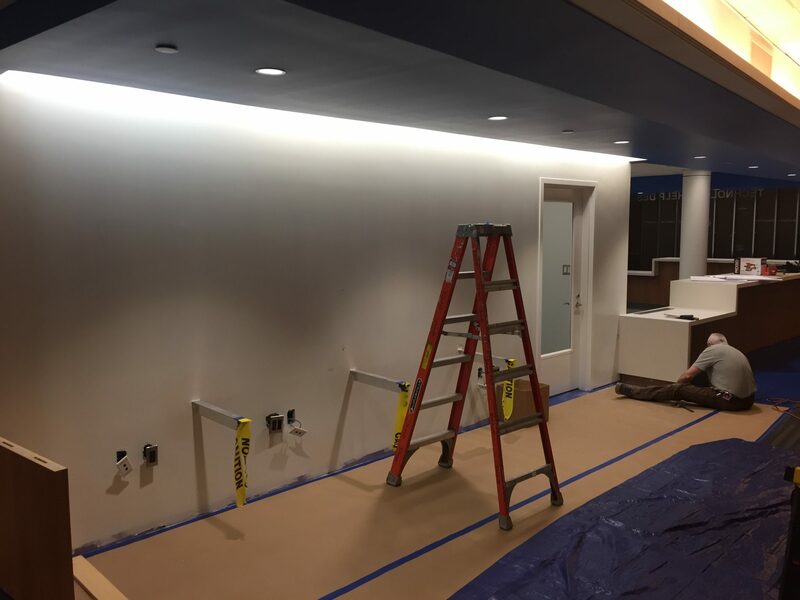 The renovation will be accomplished in two phases. 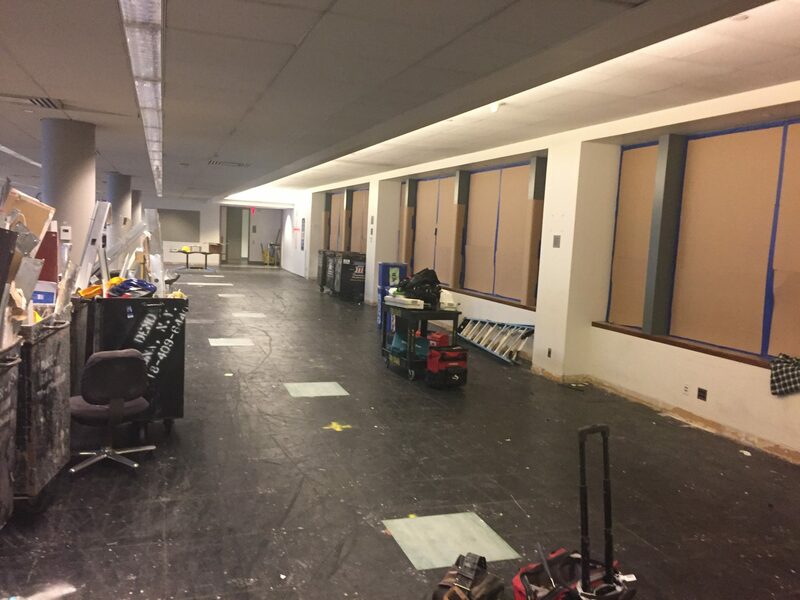 Phase one will start with the construction of a temporary wall to separate the lab’s north and south sides. Full-scale construction will then begin on the south side, while the north side remains open. Once the south side renovation is completed, the south side will reopen. Phase two of the work will focus on the north side. 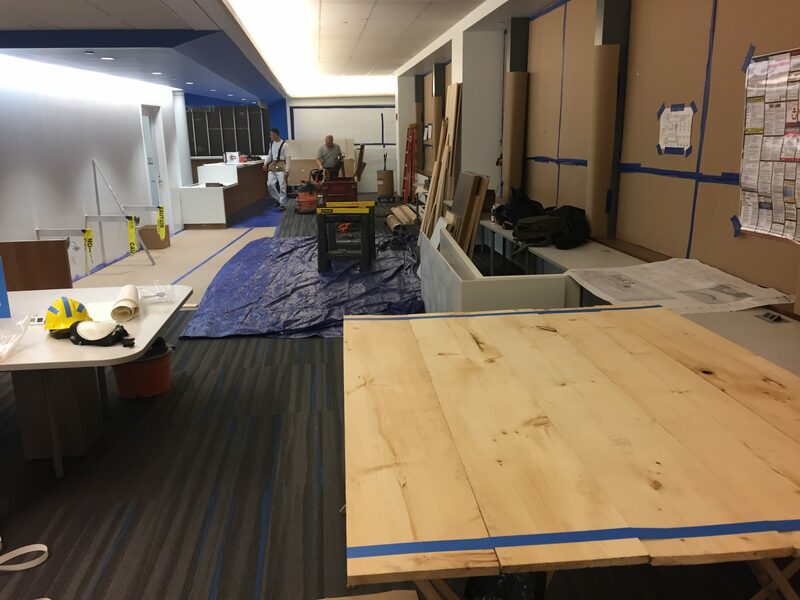 Note: While each side is under construction, lab computers will be relocated and available on various floors of the Newman Library. 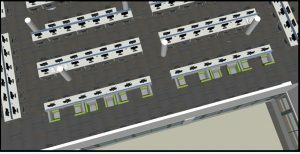 To accommodate extra use of the library, temporary additional seats will be available on each floor for the duration of the project. 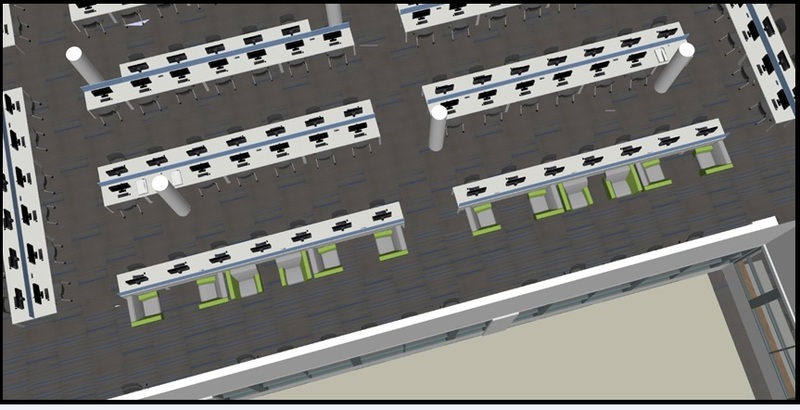 The architectural renderings of the renovated lab are provided below.